PJs, The (television) Half-hour television comedy series debuted on Fox on January 12, 1999, after a preview on January 10, and ended on June 17, 2001. 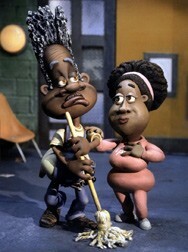 Produced in a stop-motion animation technique called “foamation,” the series is set in a big-city housing project, and takes a satirical look at urban family values through the eyes of Thurgood Stubbs, the cantankerous superintendent of the Hilton-Jacobs Projects, his wife, relatives, and friends. Voices include Eddie Murphy (Thurgood Stubbs), Loretta Devine (Muriel Stubbs), James Black (Tarnell), Michael Paul Chan (Jimmy), Ja’net DuBois (Mrs. Avery). The animation is produced by Will Vinton Studios.